A group calling themselves Papanui & Hoopers Community and Environment Protection Group (PPG) are opposed to this proposed subdivision. Will Lewis, PPG coordinator, has provided the infomation below that could be of use when preparing your submissions. 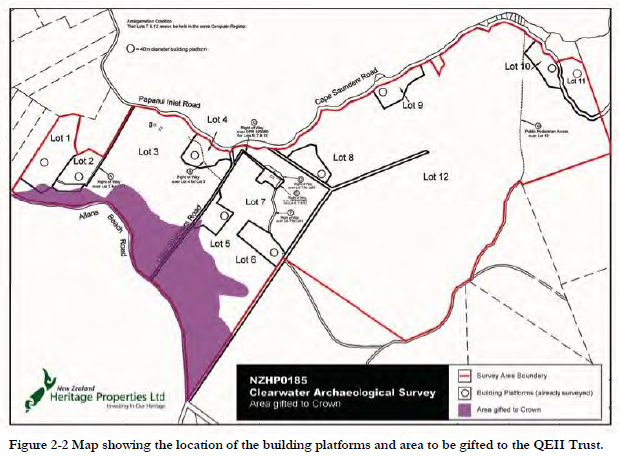 There have been rumours of a subdivision on Papanui and Hoopers Inlets for some time now. Last month the DCC received a subdivision application, and last week the DCC posted letters notifying who it believes are affected parties. Some of you will have received this notice in the last few days. Several local property owners and interested parties opposed to the subdivision have formed a group; Papanui Hoopers Community and Environment Protection Group (PPG). As its name states PPG wishes to protect the current environment and community. In the event the subdivision is granted consent, PPG wishes to ensure there is restrictions and controls on what is developed as none are proposed in the application. 1. What is proposed ? 2. Who is affected ? 3. What can you do ? 4. The time frames for submissions (supporting or against). 5. Why form PPG, and what is PPG doing ? 6. Suggestions for those that are supporting or neutral. 7. Suggestions for those that are opposing. Resource Consent Applications are large wordy documents. We have tried to keep this short and simple. Remaining area working farm (with a covenant proposed to restrict further residential development on the farm (lot 7 47ha + lot 12 147ha). Sections of the land to become QEII (Queen Elizabeth II National Trust land is permanently protected via an open space covenant). Specifically the existing bush clad hill to the south of the quarry, and the mud flats to either side of this around Allans Beach Rd. A map of the proposed subdivision is attached. 2. What is affected ? The peacefulness and tranquillity of this area, with its iconic landscapes and seascapes. The diverse range of fragile wildlife which live in and around the inlets is something that needs protection. In essence more humans (bringing their cats, dogs, cars, and boats) will have an impact on the area. The proposal will close to double the number residential properties in the area. There will be more artificial light affecting a highly regarded dark sky area. There will be more septic tanks leaching into the inlets. There will be more people walking their dogs on the beaches. There will be more traffic on the road. Recorded and unrecorded archaeological sites are likely to be impacted. The subdivision application argues that the 10 existing bach lots (245-297 Cape Saunders Rd), and some surrounding lifestyle lots set a precedent of smaller rural lots, therefore the proposed undersized 2-3ha lots should be allowed. The issue PPG has with this, is that if the DCC approve the subdivision then in future surrounding farms have very strong grounds to subdivide smaller lots also. The thin end of the wedge. Submissions must be sent to; Dunedin City Council, PO Box 5045, Moray Place, Dunedin 9058, and to The Peninsula Holding Trust, C/O Cubitt Consulting Ltd, 11 Bedford Street, Dunedin 9012. Feel free to add your photos, comments and stories. 4. What are the time frames ? Submissions must be in by 9th December 2016 at 5pm. Once all submissions are in there will be a council hearing, and following this a decision will be made. After the decision is made and published. The parties then have 15 days to appeal the decision (it is at this stage that a group can be very effective). PPG was formed to speak on behalf of the local community and to ensure the local environment is not impacted. PPG are opposing the proposed subdivision on Papanui and Hoopers Inlets. In the event the subdivision proceeds PPG wants to ensure that conditions are placed on the development that protect the community and more importantly the environment. PPG also want to communicate with what we believe are the affected parties. PPG is still in its infancy and are interested in talking with those that wish to contribute time and effort (legal and planning expertise would help). If this is you please let us know by replying to this email stating your name and number. PPG are investigating the conditions of the application further, especially those around the areas to become QEII covenant and how the proposed “environmental enhancement package” will be managed, maintained, and ensured continuity. Notably the quarry owned by the applicant has been in breach of its Resource Consent conditions. PPG will make a submission in due course. We also recommend that you make submissions as individuals. Some will be supporting, some neutral, and some opposing. A. 50% of all new residential sites must be planted in local natives with a QEII protection covenant. Non native plantings are not permitted (to prevent weed spread). B. Proposed new residential dwellings, sheds, and fences must be of new natural materials (stone, schist, cedar, macrocarpa, etc). C. Relocated dwellings, and second hand materials are not permitted. D. Building sites to have a 6m max height limit. E. The new residential sites cannot be used for commercial accommodation, or commercial businesses. F. Building footprints must be between 100m2-250m2. Only one auxiliary building per site is permitted, with a max footprint of 25m2. H. Cats and dogs are not permitted. I. That driveways must be gravel to maintain the rural aesthetic of the area. J. That new dwellings and landscaping reflect the rural aesthetic of the area, and must be designed by a registered architect. K. That $50,000 (fifty thousand dollars) be donated to Otago Peninsular Biodiversity Trust to help continue its work in the area. L. That a 10m wide buffer strip of land boarding Cape Saunders Rd, running from Lot 10 to Lot 3 (including the street frontage of those Lots) must be fenced from stock and planted in natives with a QEII protection covenant. (I.e a roadside strip from Kaimata Retreat to the Quarry – providing a place for native birds and wildlife to nest). M. That helicopter pads and airstrips not permitted. N. The proposed environmental enhancement package, the access way to Mt Cargill, and QEII areas be securely fenced, formed, gravelled, planted and completed (as required), and approved by QEII Trust as satisfactory prior to the new titles being granted. Further, that annual inspections of the fencing and planting be carried out by QEII Trust, and that any amendments or breaches be remedied by the applicant (Clearwater). A. We believe the proposed development is inappropriate for this area. The argument that there is some remnant of earlier occupation / buildings (as argued by applicant) is not relevant in modern times. B. The argument that the proposal is in keeping with “. . the naturally anticipated development of the area” implies that all areas will be developed in the future. We feel that this area is listed on the District Plan as Peninsula Coast Outstanding Landscape Zone because it is special, and therefore should be preserved. C. The area is a natural asset to the city attracting nature tourists. There are many species of birds and seals that live in and around the inlets. Victory Beach yellow eyed penguin colony was down to two breeding pairs last season. Increasing the population density in this area will not help this endangered species. For this reason alone the application should be declined. The Ecological report submitted by Clearwater did not record any threatened or at risk species of bird or sea lions (nationally critical) that nest around the inlets. As professional Ecologist they have a duty to write a correct and impartial report for the DCC. They have failed to do so. We would like the following birds to be recorded as inhabitants of the area that are at risk; Falcon (nationally vulnerable), fernbird (declining), pipit (declining), royal spoonbill (nationally uncommon), Pied Oystercatcher (declining), Pied Stilt (declining), Rifleman (declining), Variable Oystercatcher (recovering), as well as sea lions (national critical). It is also a habitat for many other native species. D. The area is littered with archaeological sites, recorded and unrecorded ones. These areas should be respected and preserved. E. We appreciate that the applicant has gone to expense commissioning geotechnical, ecological, archaeological, and landscape reports. These and the application from a professional planner are clearly bias towards their paying client, at one point Mr Moore (Landscape Consultant) goes so far as to say; “Its my assessment that the proposal maintains and enhances the rural character and associated amenity values”. He is saying; further development will make it look more rural. We strongly disagree. Interestingly these consultants did not consult the local Iwi, and overlooked the fragile bird and seal populations that live in these inlets. Both these parties have been overlooked, yet they are fundamental to the area. F. Rural land fragmentation and scenic landscape protection is reason the DCCs new District Plan is moving to 40ha min size sites in these rural zones. What is being proposed will fragment the landscape and impact on a ‘Peninsula Coast Outstanding Landscape Zone’. The proposal is contrary to the District Plan. G. Under the RMA the DCC is required to provide ‘protection of outstanding natural features and landscape from inappropriate subdivision, use, and development’. We are calling on the DCC to act on this mandate. H. Allowing this subdivision is in contradiction to the framework of the District Plan policies. We believe the effects on the environment to be more than minor (as argued by the applicant), and that this subdivision is very much contrary to the framework of the District Plan policies being; 40ha min site sizes, and the Peninsula Coast Outstanding Landscape Zone. It is our view that Section 104D tests for non-complying activities are not satisfied. You can add your own bits and pieces . . . we also suggest you add the conditions stated in # 6 above be applied in the event the DCC approve the application.